Blacksmithing can be a nice little moneymaker at the high end and allows you to make several nice weapons and full armor sets at various points while leveling the skill. 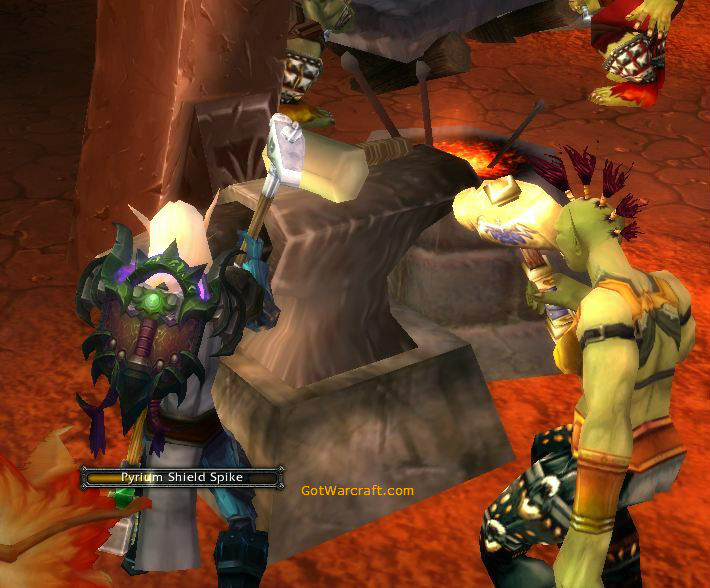 In Warlords those special gem sockets that you could add to your gloves and bracers are gone, but you can make raid quality gear and equip it at level 91. One there there was a quest where a Blacksmith could specialize in Armorsmithing or Weaponsmithing. With Cataclysm those specializations were removed and all Blacksmiths will have access to the same recipes from any trainer. Some of the Cataclysm items are well done. The Redsteel and Hardened Obsidium sets are nice. Some of the higher level stuff is too expensive to create given how easy it is to get better gear with Justice points. Other items, such as gem slots and keys, are certainly useful. Profession Perk: Blacksmiths can add a gem socket to bracers and gloves. Gems in Mists have twice the value for secondary stats as for primary stats, 360 Haste Vs 160 Str, for example. This gives those two slots more versatility than other profession buffs, especially if your spec values something other than the primary stat. Profession perks are dead in Warlords of Draenor. In addition to gear pieces you can make items (sharpening stones and weightstones) to buff your weapons damage, others items that act as enchants (weapons chains,) rods for enchanters, and a few misc. other useful items. Want to have a guide to power leveling all of your professions in an in-game window? Go here and get yours. What about Mining? You will want ore to craft various items and to create the Draenor ingots needed for your more epic Blacksmithing. With your Garrison mine you will not need the mining skill, though of course you will if you want to mine the world. Ores can be bought off the Auction House, too. The Draenor ores and the Ingots created from the basic ores (Blackrock and True Iron) are all you will need for most of your Draenor Blacksmithing, though you will want additional materials for higher end stuff. First off, none of the bits in the charts below this section are obsolete. In fact, if you’re under level 90 and you want to level your Blacksmithing skills, you’ll pretty much have to follow that list. Once you hit 90 though, and enter Dreanor, you can take your level 1 skill and level it to the max without ever entering the old world, except to buy materials. None of the old recipes will be needed. Under level 85? You’ll need all the old stuff and will have to visit your trainer to learn new recipes.Most of the materials needed can be bought off the Auction House. Level 85 – 90: You can level your Blacksmithing from 1-600 in Pandaria, through work projects your trainer can provide. You will need 4607 BARS and 5 Spirit of Harmony to lvl from 0-600. You can get the projects from the Pandaria trainers in Vale of Eternal Blossoms: Cullen Hammerbrow (Alliance) and Jorunga Stonehoof (Horde.) Upon learning the skill, they will have the quest So You Want to Be a Blacksmith… for you. Your Blacksmithing trainer is no longer needed for increasing your skill. From skill level 1 to 700 you can stay at your forge and never have to visit him for skill boosts. For any or all of the pre-Draenor recipes you will want to have a chat with him. You can get all of the Draenor recipes through your Garrison or the vendor in Ashran. Yes, it’s true. You can enter Draenor, learn Blacksmithing there, and level from 1 to 700 in the comfort of your Garrison, or the Ashran forge. One more nice thing about Warlords crafting is that you can go from 1 to 700 crafting one item. Find something you need, or that you can sell, and make a big pile of it. Details below. You will see a lootable item early on in your Draenor wanderings. Clicking that item will start you on a series of quests (not hard) to get your Draenor Blacksmithing skills. When done with the quests you will get a scroll (Draenor Blacksmithing) that will raise your skill cap (not your skill level) to 700 and teach you several new recipes. These are the items you’ll need to start the quest. If you have the Blacksmithing skill, even at level 1, they should drop very early on in your Draenor questing. Draenor Blacksmithing can also be bought for 100 gold from a vendor in Ashran (ask a guard for the location.) Might as well just find the thing and save the money. Or buy it and save the time. Your call. Truesteel Ingot – required for the nice stuff. Smoldering Helm – basic helm. More Recipes are, naturally, available and you can grab them from the Blacksmithing vendor in Ashran or a vendor in your Blacksmithing hut in your Garrison. Most of the recipes will cost one Secrets of Draenor Blacksmithing, but some will cost five. The latter recipes will boost the item level of the better arms and armor that you create. Ok, so you’re at least 90 and have the Blacksmithing skill, at least level 1. Every day you will want to make your one Secrets of Draenor Blacksmithing and then buy a new recipe. You will need five of them for the special recipes, but you’ll be able to get the armor and weapons for one each. Truesteel grinder and truesteel reshaper give +3 skill at half the materials cost of the rare armor and they stay orange until 700. Rare weapons give 10 skillups until 700. Leveling to 700 is easy, but you’ll want a very large pile of ore. Note that for 60 pieces of ore you can make one piece of Smoldering armor for +5 skill or two grinder/shapers for +6. The latter is more efficient and might well be easier to sell. Under skill 600: You will make a pile of grinders/reshapers. You will need 30 pieces of ore for each item. For example, if you have 300 skill then you will need 30 ore x 100 items = 3,000 pieces of ore to get to 600. 3,600 pieces of ore if you make the armor, instead. These two items go gray at 700, so they’re excellent for leveling all the way. Yes, you can level from 1 to 700 by repeatedly making one item. Make as many as you need at +3 skill each. Truesteel Grinder requires 20 Blackrock Ore and 10 True Iron Ore and gives +3 Skill. Truesteel Reshaper requires 30 True Iron Ore and gives +3 Skill. Skill 600 to 700: You can start making the epic armor, if you like. Buy the appropriate recipe with one Secrets of Draenor Blacksmithing. Making “secrets” awards +1 skill until 650, when it goes green. After that it might award one skill until 700. Your daily Tuesteel ingot will award 1 point. All of the True Steel armors and the Steelforged weapons provide ten skill and require 100 Truesteel ingots each (plus some other small stuff) to make. Truesteel ingots come from your daily Truesteel Ingot craft and from your Garrison work orders. It will take you a few days to make those 100 ingots. Make more Grinders/Reshapers at +3 skill each, all the way to 700. 1 – 700: Just make 234 grinders/reshapers (using 7,020 pieces of ore) and you’re done. Welcome to 700. Chances are you will eventually be able to sell all those grinders on the Auction House and maybe even make a profit, depending on your server and how much you paid for the ore, if anything. If you’re under level 90 you will have to follow the old system until you get into Draenor. Otherwise you can wait till 90 and you have your Garrison, and then power-level your skill. 1-75, Apprentice Blacksmith, Requires level 5. 76-150, Journeyman Blacksmith, Requires level 10. 151-225, Expert Blacksmith, Requires level 20. 226-300, Artisan Blacksmith, Requires level 35. 301-375, Master Blacksmith, Requires level 50. 376-450, GrandMaster Blacksmith, Requires level 65. 451-525, Illustrious GrandMaster Blacksmith, Requires level 75. 500 – 600, Zen Master Blacksmith, Requires level 80. In order to gain the new Contender’s gear recipes or to create epic gear you will need to obtain Spirits of Harmony. You do not need these to level your skill to 600, but you will spend a lot of Ghost Iron bars to do so. We recommend getting at least two of the spirits. Spirit of Harmony is assembled from ten Motes of Harmony. These are uncommon world drops (anything you kill can drop them) and leveling from 85 to 90 will probably get you enough to make 5 or 6 spirits. You can earn them from various daily quests that award Treasures of the Vale. Each treasure has a chance to contain a spirit. If you have enough Tiller’s rep you can buy seeds and farm your spirits, at a rate of about 1 per day. You can spend your extra Conquest points, from rated PvP, and buy them from the PvP vendor. You can find a Blacksmithing trainer in Pandaria: Len, the Hammer <Blacksmithing Trainer>, friendly to Horde and Alliance. Found in Dawn’s Blossom, in the Jade Forest, but your regular trainers have the same recipes. For the new recipes, all the Contender and Masterwork recipes, you will need at least one Spirit of Harmony in order to buy them and they are only available from the vendors shown below. The other recipes (Lightsteel, etc.) are available from any Blacksmithing trainer. To access the M of P vendors you will need to do a quest series to access the zone, which requires level 87+. 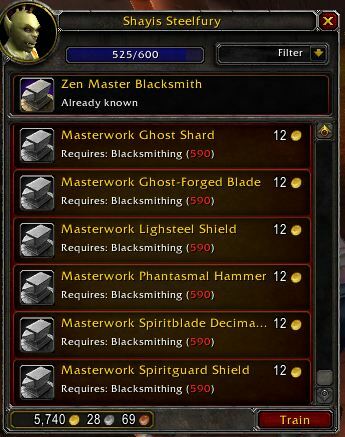 You do not need to be level 90 or have any particular rep to buy patterns, but you DO need to have Blacksmithing skill in order to see the patterns the vendor has to offer. A minimum of 208 Ghost Iron bars and 10 Trillium bars will be needed to level to 600. 5x Ghost Iron Bar10 bars total. 577-600 5x Masterwork Spiritguard Shield or Masterwork Lightsteel Shield, 5 skill points each. (each recipe costs 1 Spirit of Harmony to buy)The following items go grey at 590 and green at 595, but do not require Trillium bars. Trillium bars are probably cheap enough, so unless you have a ton of bars go with the shields, above. Shields: 12x Ghost Iron Bar and 2x Trillium bar60 Ghost iron and 10 Trillium total.Breastplates and Helms: 12 bars each.36 bars to get to 590, then a whole bunch to get to 600. Congratulations on your 600 Blacksmithing skill! Lots more Gold from Farming, Gathering, Crafting, the Auction House – Click Here Now. All of the following sets are Plate, unless otherwise noted. Only sets with at least chest and legs are included. There are various other sets that you can make that have three or four pieces, but that aren’t listed here. Before you sell these pieces make sure you check the Auction House prices. Some are in demand as Transmogrification pieces and might fetch high prices. You can see a few of these sets here. Warlords has no epic gear sets. You are allowed to wear epic three crafted items, and there are only three pieces of the rare Smoldering gear available. Obviously you could make either rare or epic and then get other pieces to match, but that hardly makes up a “set,” right? Links will take you to WoWhead’s search for the appropriate items. Levels are the minimum level needed to equip items. Redsteel, level 81 to 83, complete DPS set. Dark Iron – all, but belt, levels 51 to 60. Includes weapons. view here. Is there a set of crafted PVP gear here for 90 like the Vicious for 85? If so can you like to it like you do for the other sets please? I’m wanting to make some for my son. Thanks. 🙂 Yes, there’s a set of crafted PvP gear available, the Contender’s set. You have two be level 87 and do a series of quests to access the zone, then have one Spirit of Harmony for each pattern you want to buy. I’ll update the guide appropriately, meanwhile here are the specs of the gear. Excellent! Thank you 🙂 Got half a set done now. Kudos again on a job well done in this guide sir! Yeah, “recommended quantities” is actually on the To Do list. I’ve been hanging back, waiting for the fist flush of Hotfixes to be done. There’ve been some changes to how things and maybe how many mats will actually be needed to go from one point to another. It’s probably time to get on those now. For example, I went from 540 to 600 in Inscription with one glyph. This is completely different from how it worked earlier. I assume that will change. Just what I need for my fresh 85 warrior! Greatly appreciated.